It all started when I bought some vegan kimchi. I had some tofu and some mushrooms at home, and I started thinking about making a Korean dish with all of these ingredients. It’s a dish I’d seen before, even though I didn’t know what it was called. I decided I’d need some garlic and ginger, as well as some miso paste for seasoning, so I went to my local Korean bodega, just a few blocks away. 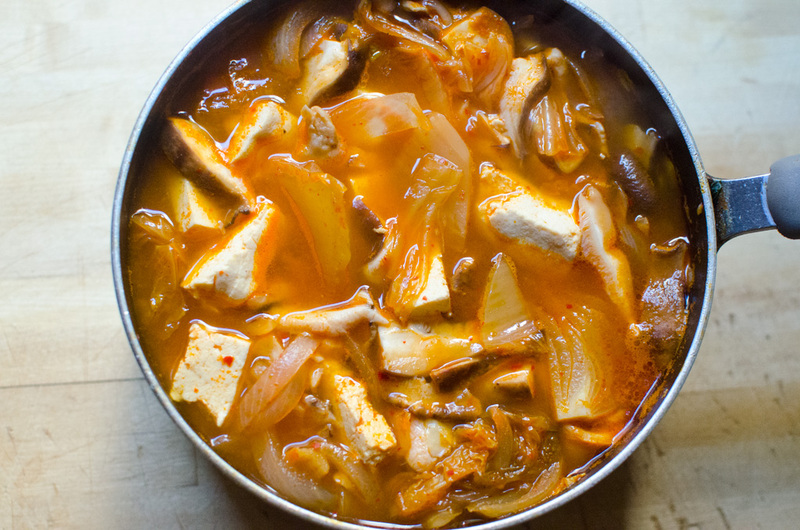 The Korean woman who runs the bodega asked me if I was making miso soup, but when I told her I was planning to make some Korean food with kimchi, mushrooms, and tofu she immediately said, “kimchi jjigae!” She pointed to the miso paste and said I didn’t need it. Then she told me how to make it. A little background information first. I’ve been shopping at this bodega for years, and the Korean woman and I have gotten pretty friendly — as friendly as two people can be who don’t know each others’ names, anyway. I originally started shopping there because of their freshly-made tofu, which is both delicious and ridiculously cheap. A few years ago after the bodega underwent renovation they started carrying a lot more fresh produce, so it became my go-to place for shopping. I’m in there three or four times a week, so I see the Korean woman quite often. So here’s her recipe. Keep in mind her English is a little fragmented, and I speak no Korean at all, so I may have misinterpreted a step or two. It still comes out delicious, and it’s super easy. Start by sauteing a small onion with oil in a pot. When the onion softens, add kimchi and water, and bring to a boil. When it boils, add cubed tofu and sliced shiitake mushrooms. “You’re vegetarian, right?” she asked at this point. Like I said, we’ve known each other for a while. When I confirmed I was a vegetarian, she said to add A LOT of mushrooms. Then add some pepper. (I thought at first she meant regular black pepper; later, after thinking about it, I realized she probably meant to add either Korean red pepper flakes (gochugaru) or red pepper paste (gochujang). I had some gochujang, purchased at the very bodega, so that’s what I added. I also tasted it for seasoning and thought it needed some salt, so I added some.) Then let it boil together until the mushrooms are cooked through, and serve over rice. Cooking smooths out the funkiness of the kimchi, but at the same time that the kimchi liquid flavors the broth. The herdest part of the recipe is getting your hands on the vegan kimchi, but if you don’t like in a place that sells it I have good news for you: you can get it delivered. I’ve made it twice now, and one of those times I added some noodles to it. I think technically that makes it budae jjigae, but I think kimchi jjigae has a nicer ring to it. Unfortunately I don’t have the cool clay pot it’s usually served in, but if I end up making the dish more often, maybe it will be worth the investment. In the meantime, heed this advice: if a woman who runs a Korean bodega tells you how to cook something, you had better pay attention. 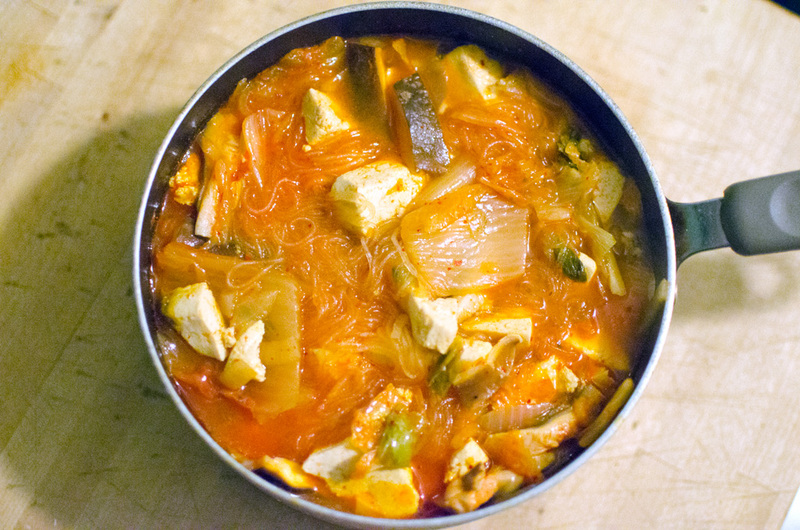 This entry was posted in cooking and tagged cooking, kimchi, kimchi jjigae, korean, vegan. Bookmark the permalink.